PART THREE of a serialised novel – a heart warming and inspiring story about living the simple life and the joy of animals. Well little Sam may have believed that she was an experienced veterinary receptionist that could confidently give an hand when needed but giving an hand in a warm surgery and being full blown up to your elbows in it on a farm are two quite different things and Sam is loving every minute. The more involved she is the more she is determined to take control of her own destiny. That includes facing the demons from her own past if she is to survive country life, and keep the job she loves. Part three is definitely a book of secrets and betrayal for both Sam and Joe. With one thing for sure, relationships, both old and new will never be the same again. 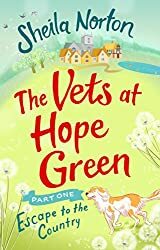 Sheila Norton has breathed life into the characters of Hope Green, making a fun filled cosy read that tackles some very delicate subjects. It all fits together beautifully to make an exciting and at times emotional journey. There are some really hard times ahead for the people of Hope Green but also new life too. Sheila Norton lives in Essex and worked for most of her life as a medical secretary, until retiring early to concentrate on her writing. 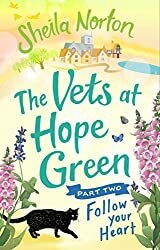 Her most recent novels are published by Ebury (Penguin Random House) and are contemporary fiction with animal backgrounds: ‘The Vets at Hope Green’ was preceded by two ‘cat’ stories: ‘Oliver the Cat Who Saved Christmas’ and ‘Charlie the Kitten Who Saved a Life’. 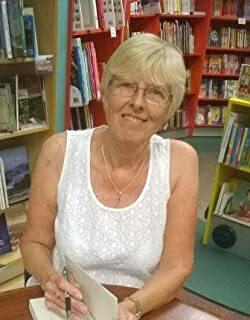 Sheila’s first novel was published in 2003 and most of her earlier books were of the ‘chick lit’ style of women’s fiction, apart from two books set mostly in the 1960s and one book about grandparents. She has enjoyed writing all her life, but her writing career first really took off in the 1990s when she won two first prizes for her short stories, and went on to have over 100 stories published in women’s magazines.